Tent camping is a fun way to get in touch with nature and Hidden Cove has everything you need to provide your perfect getaway. Camp among the trees, alone the waters edge, with a large or small group – the choice is yours. Create the camping trip of your dreams and live it out in our 42-acre park. There is a $25 charge for each tent entering the park. Of course, what else you end up needing will depend on many factors such as what you plan to do, the purpose of your trip, personal taste, and who is coming along. 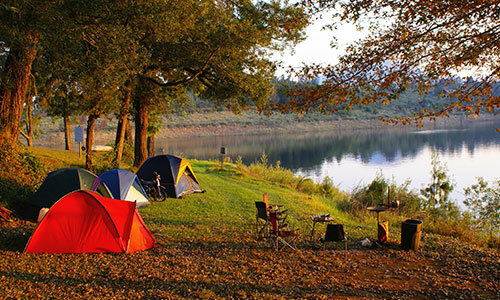 As experienced campers we have taken the liberty of providing a head-start checklist for you. Feel free to print this out and make use of it before visiting our campgrounds. Pet gear – food, ball, ect. Plan ahead and keep a checklist logged as items pop in your head. Make it easy on yourself and try to pack lightly. What can you live without for a day? Foods that do not have to be refrigerated or cooked might be best for your trip. Sometimes dogs have trouble handling new environments. Bring items to soothe them and keep them busy. Using headlights while parked at night can bother other campers and is not recommended. Do not leave food open or out as it could attract animals or insects. If you'll be near the wooded areas, learn what common poisonous plants and insects look like. Avoid odors and hazards by setting up tables, chairs, tents, and yourself away from the direction of smoke blowing from fires. You may need a mallet or other tools to set up your tent. Check your model and bring those items with you. Avoid camping under trees that look old or dead as branches could break and cause a serious injury. Pitch your tent away from fire smoke. Heavy wind can also flip your tent, so try to avoid it. Smaller tents have less space but are typically easier to transport. Decide what's best based on your needs. Trees provide shade but also can be more susceptible to critters like spiders, so it's not a good idea to camp directly next to one.